Deal of the Day: Save up to 30% on Select Puzzles for 1/24/2019 only! Today you could save up to 30% on puzzles ranging from 200 pieces to over 1,000 pieces. There is a puzzle for everyone to enjoy and great to do when your stuck inside because of this cold weather we’re all having. Take advantage of these savings and grab a puzzle today from amazon.com. Deal of the Day: Save 35% on Select Toys From Melissa & Doug for 11/19/2018 only! Today you can save on selected toys from Melissa & Doug. Melissa & Doug have a large variety toys for infants and up? Not only are the toys fun, but also great for fine and gross motor and cognitive skills. Melissa & Doug toys are designed to fuel imagination, inspire exploration, and encourage the natural curiosity that leads to a lifetime of learning! From classic wooden toys to creative crafts for every age, Melissa & Doug’s timeless products educate and enrich in a way that’s as natural as playtime itself. 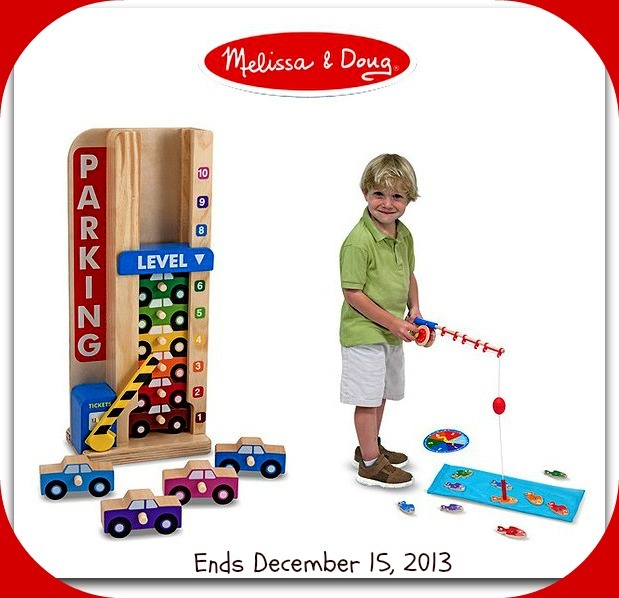 Deal of the Day: Save up to 50% off Select Melissa & Doug Toys for 12/02/2015 only! Today only, save up to 50% on select Melissa & Doug Toys. It’s our Gold Box Deal of the Day. (restrictions apply) and Prime (restrictions apply). This one-day offer is valid on December 2, 2015, or while supplies last. Discount is already included in the current Amazon.com price. Applies only to purchases made from Amazon.com and does not apply to products purchased from third-party merchants on the Amazon.com website. Deal of the Day: Save up to 50% Off Select Puzzles for 1/23/2015 only! Save on select puzzles from Melissa & Doug, Ravensburger, and White Mountain Puzzles. Today only, save up to 50% on select Puzzles. It’s our Gold Box Deal of the Day. Also, for an even greater value, take advantage of FREE Shipping (restrictions apply) and Prime (restrictions apply). This one-day offer is valid on January 23, 2015, or while supplies last. Discount is already included in the current Amazon.com price. Applies only to purchases made from Amazon.com and does not apply to products purchased from third-party merchants on the Amazon.com website. Filed Under: Bee Keeper Tagged With: Amazon Deal of the Day, Amazon Deals, Amazon Flash Sales, Amazon.com, Melissa & Doug, Puzzles, Ravensburger, White Mountain Puzzles. I recently had a chance to review two toys from Melissa & Doug. What attracted me the most to their line of toys was the quality, appearance, and they reminded me back when I was in school. I remember those being the funnest toys. These toys allow your child to use their imagination because they have to interact with the toy to make it come alive. 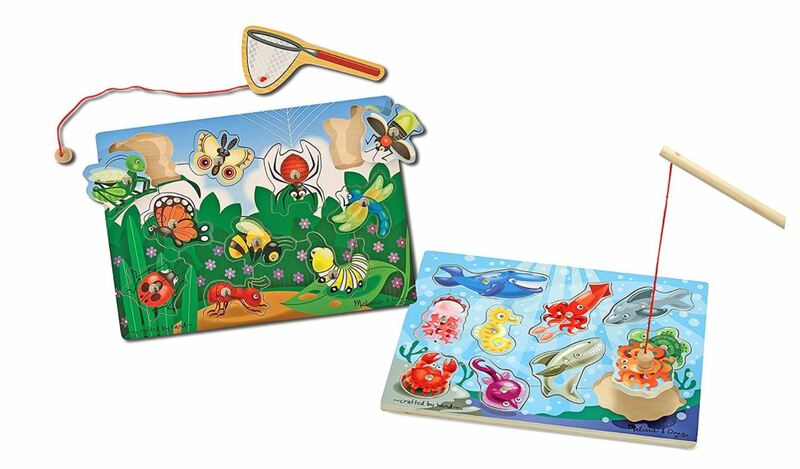 Melissa & Doug offer a HUGE variety of toys, crafts, games, and stuffed animals. When it comes to choosing the right toy the options are endless, plus they have toys for kids from birth to about thirteen years of age. Me being a mother of four any toy that I choose I like knowing all the toys are safe and that they are learning while having fun at the same time. Even my thirteen year old likes to help her brothers play and loves trying to teach them as well. One thing I have to point out about Melissa & Doug is that not only do they make wonderful toys but, they also make sure to make those toys for those who have Special Needs. Those whom have Special Needs like my son who has Cerebral Palsy, you know it is not easy to find the ultimate toy that challenges them but, is fun at the same time and doesn’t cost a fortune. Now let’s get straight to the toys shall we? 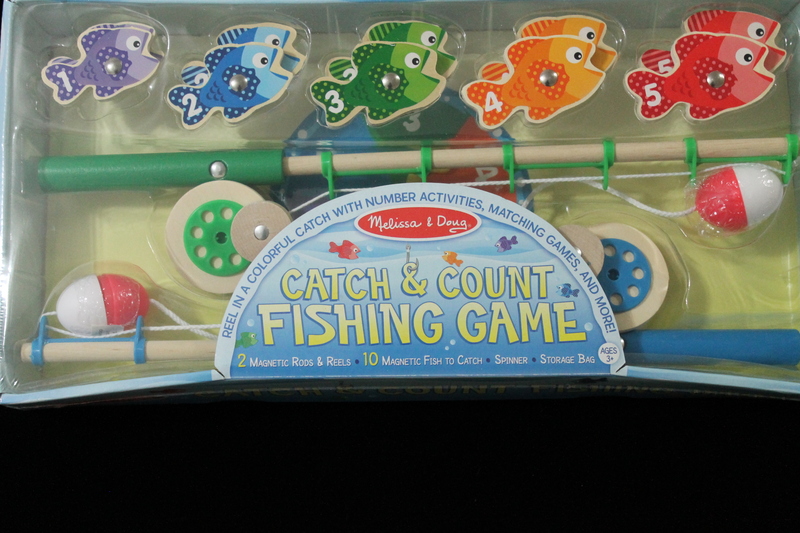 The Catch & Count Magnetic Fishing Rod Set Is definitely a fun toy! I have bought something similar in the past from a store and it was all made out of plastic and everything broke within two days. I can honestly say that the whole set is still in one piece and it has been almost a week and you get two fishing rods unlike others you only get one. So there is no fighting over who gets to play. You can just fish or make a game out of it just by catching by number or color. It is a great way for them to learn their colors and number and it makes for great interaction. 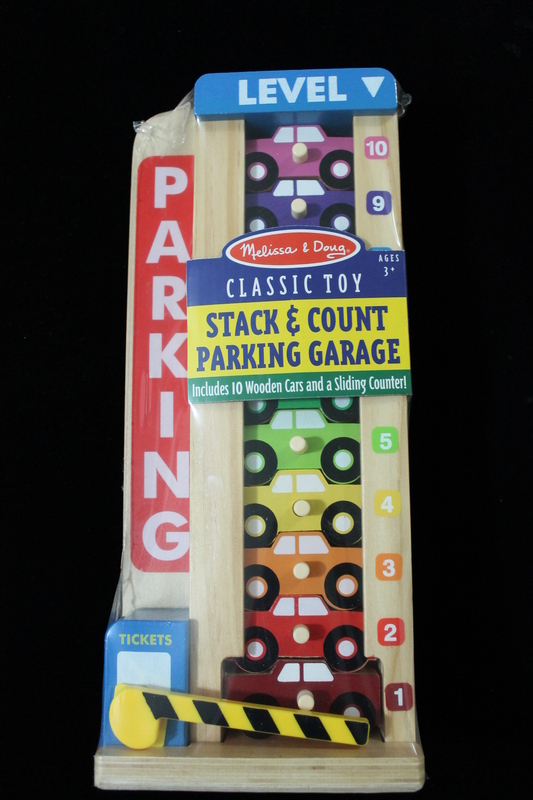 The Wooden Stack & Count Parking Garage is great for any little boy or girl whom loves cars of all types! I Don’t know any boy who doesn’t love cars! All three of my boys a car fanatics and we have everything from hot wheels, remote controlled, car movies, and clothing. You name it we probably have it except, a wooden car. I love the idea of these car because they are light weight and educational. 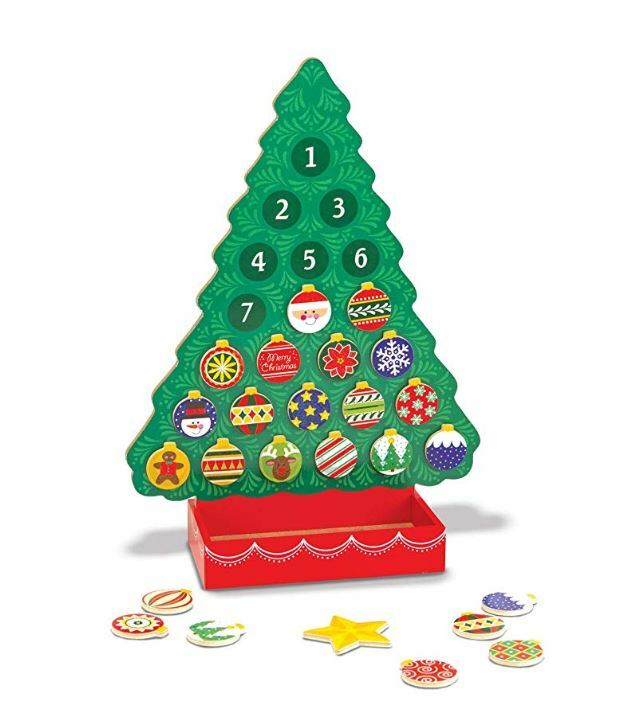 This set is perfect way to teach colors and counting. They can identify the numbers and the colors but they do get the two greens confused a bit but that is not a big deal. There are no actual wheels on them, they are just painted. My boys tend to drive them on the carpet and floor and a play rug that is for cars and they are really smooth. No need to worry about splinters and such. From day one, we’ve signed our names, Melissa & Doug, to every product we make. We take that signature seriously — it’s our commitment to you that you can trust the products you bring into your home. As parents, every time we make a product for you, it also has to pass the test of coming home with us, where we enjoy playing with these same toys with all six of our children. No matter how carefully we design our products, we believe there’s no substitute for TESTING, TESTING, and MORE TESTING. The key to assuring the safety of our products is not simply insisting our factories follow our instructions, but to go one step further and AUDIT, INSPECT, AND TEST, not only once, but at various phases of the production process. This is something we’ve always done. Additionally, we specifically test our paints and coatings very frequently, to be sure our toys meet or exceed government recommendations limiting heavy metals, lead and phthalates in children’s items. We have cabinets full of thousands of passing test reports, and these passing results have been verified by 3rd party independently accredited testing laboratories, considered by many to be the best scientific laboratories in the world. Please continue to enjoy our toys with confidence, knowing that each and every time we design and craft a toy, we’re not only making them for you, but for our own kids too. All prizing is provided by Melissa & Doug. 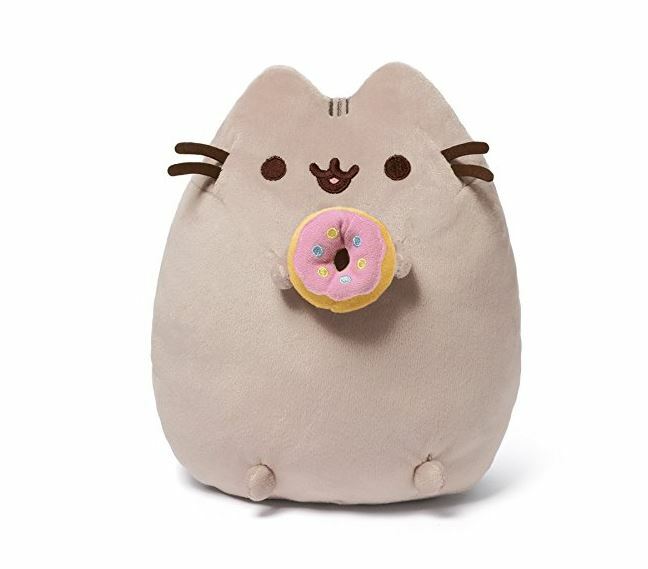 Giveaway open to U.S. Only! 1 (One) Winner will receive one Stack & Count Parking Garage and one Catch & Count Magnetic Fishing Rod Set! *MSRP $44.98* This giveaway ends on December 15, 2013. To enter please use the Giveaway Tool below. Good luck! Disclosure: I did not receive any monetary compensation for this post. No purchase is necessary to enter. Void where prohibited by law. The odds of winning are based on the number of entries received. This promotion is no way sponsored, endorsed or administered by, or associated with, Facebook and is Facebook-compliant nor Twitter,Pinterest, or any social media site. Winners will be notified by email. Prize fulfillment is the sole responsibility of the sponsor. MumbleBeeInc may not be held liable for Sponsors who do not fulfill prize shipments. I received no compensation for this publication. My opinions are my own and may differ from those of your own. MumbleBeeInc is not responsible for sponsor prize shipment. This review was written solely by MumbleBeeInc. This item(s) was provided complimentary to MumbleBeeInc for the purpose of this review. I was not paid for my personal opinion of the product(s) contained in this review. All opinions are my own and may differ from those of your own. Melissa & Doug-Leading Designer of Education Toys! MelissaAndDoug.com!